Megan Gallagher, of Los Angeles, traveled with Rustic Pathways to New Orleans and Fiji when she was in high school. Travel helped Megan overcome her anxiety. Read her story below. By the time I turned 16, I had already experienced countless days filled with anxiety and panic attacks. I always felt out of control, especially when it came to my thoughts. My panic attacks became so routine that I started wondering how I’d ever become a functioning adult with a job, house, bills, and social life. How would I accomplish my goals if I could barely get through one school day? I felt like I was being controlled by some force greater than myself and couldn’t get excited about life. I was slowly becoming a victim of my own mind’s power. Someone could invite me to an event and I would immediately start thinking about the worst-case scenario. Every day felt so predictable and I was always in survival mode. I was experiencing what every other teen goes through: hormones, body changes, and coming into your own—feeling that intimidating sense of being in limbo between childhood and adulthood. On top of that, I was having more than 10 panic attacks every day—in which I would do my best to keep a poker face, while feeling like I was dying on the inside. It’s really hard to put into words the physical feeling of having that many panic attacks while trying to pay attention in class, having a social life, etc. Teenage years are such a vulnerable and pivotal time in one’s life. In February 2012, during my sophomore year, I was on my computer after school one day and stumbled across Rustic Pathways. It looked so intriguing with the exotic destinations and pictures of smiling teens. After looking at the website for only 30 seconds, I could feel the negative thoughts start to trickle in. I Immediately stopped thinking about it and turned off my computer. A few days went by and I couldn’t get Rustic off my mind. Something about it felt right. I was startled by this part of me that actually wanted to go. I hadn’t felt that before. I decided to tell my mom about it and get her opinion. She immediately got super excited and went on the website. She knew right away this would be a really fun experience for me. I so badly wanted to have the same mindset as her, but why couldn’t I see the amazing opportunity in this trip? After a few days of going back and forth with it, I decided I was going to sign up for the Rebuilding New Orleans (which has since been changed to Rebuilding the American Dream) community service trip that August. The moment I enrolled, I felt a huge wave of excitement and nerves. As the trip date got closer, my anxiety got worse. It started becoming so real. I had never flown anywhere alone, and now I was about to fly across the country! My mom woke me at 6:00am on the day of my trip. I took some deep breaths, cried a little, grabbed my suitcases, and headed for the door. The next two weeks were a blur of rebuilding houses in the 9th Ward, laughing, learning about Southern culture, eating Cajun food, and exploring the French Quarter. The group I was with could not have been more amazing! I was too busy having fun to be anxious. 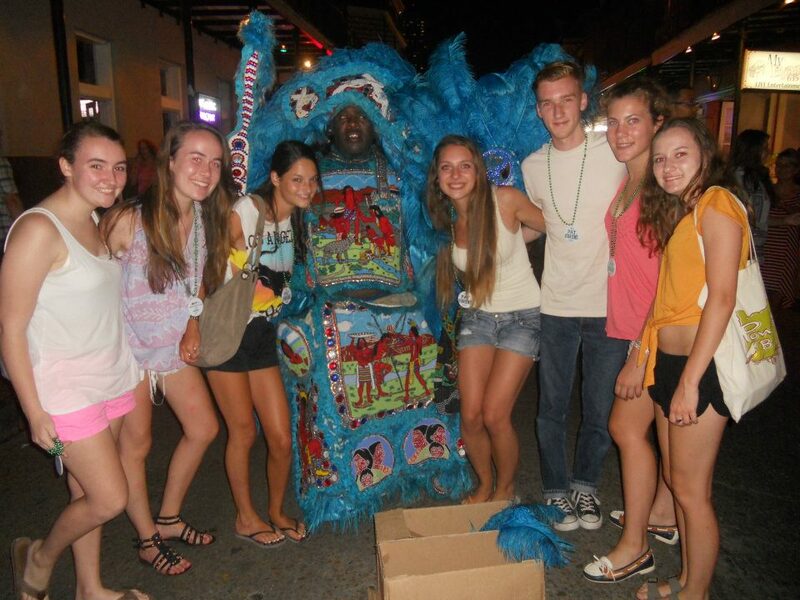 Megan, second from left, with other students from her group in New Orleans. I learned so much about myself. Life really starts when you push yourself outside your comfort zone. For me, to travel to another state at 16 years old was a big deal. I constantly felt anxious, but it was a major breakthrough moment for me. The other teens and I bonded so much over painting houses, planting flowers in the school’s garden, and telling stories when we got home. I was forever changed. The experience sparked a love of traveling in me. There is something so priceless about traveling; you always gain something new. I am forever thankful for what I learned on that trip to New Orleans. Megan is 23 and works as an inspirational speaker and author. Visit her website to learn more. Interested in a transformative travel experience like Megan’s? Request a copy of our free spring break and summer programs catalog today!